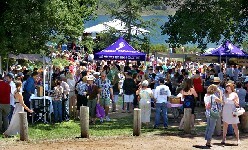 The Annual Ojai Wine Festival, in June, draws more than 40 wineries and micro-breweries from vineyards of the nearby Santa Ynez Valley www.ojaiwinefestival.com. Local High Schools host cross country meets during September and October each year. The Bill Wadlington Course, named after a veteran Ranger whose tireless efforts were instrumental in developing the events, covers 3 miles of rolling hills, winding through campgrounds on the westerly side of the Recreation Area, with welcome views of the lake during a hard run. Meets include the Ojai Invitational, Frontier League, Ventura High School Wednesday Invitational and the Ventura County Championships. Plus, we'll be out at the Ventura County Fair and Ojai Day! Come meet and talk with us at these fun events. We'll be on hand to discuss your Quagga issue concerns, fish planting status and to let you know what's new at the Lake. Lake Casitas has a large special event area and various group picnic areas that provide a beautiful lake view venue for your special event. We'll help you with the logistics for your wedding, anniversary, reunion, concert, fund-raiser or what ever you have in mind for your special day. Click here for a fillable PDF event application or call us with your questions. 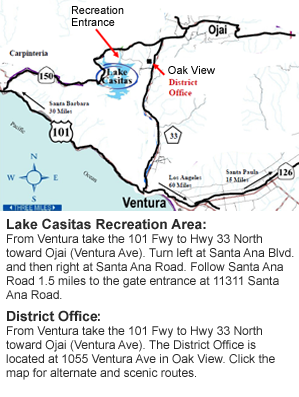 We'll help you decide if Lake Casitas is the perfect venue for your event 805-649-1122.